← What is the root cause of denialism? For years Republican politicians have claimed that increasing tax rates on the wealthiest, who are the “job creators,” will hurt the economy and lead to higher unemployment rates. I decided to test these claims by collecting evidence. The claim that higher taxes on the wealthy hurts the economy was recently tested by Thomas L. Hungerford in a 2012 publication of the U.S. Congressional Research Service (“Taxes and the Economy: An Economic Analysis of the Top Tax Rates Since 1945” CRS Report for Congress no. 7-5700 / R42729, http://online.wsj.com/public/resources/documents/r42729_0917.pdf). Here is what he found: “There is not conclusive evidence, however, to substantiate a clear relationship between the 65-year steady reduction in the top tax rates and economic growth. Analysis of such data suggests the reduction in the top tax rates have had little association with saving, investment, or productivity growth. 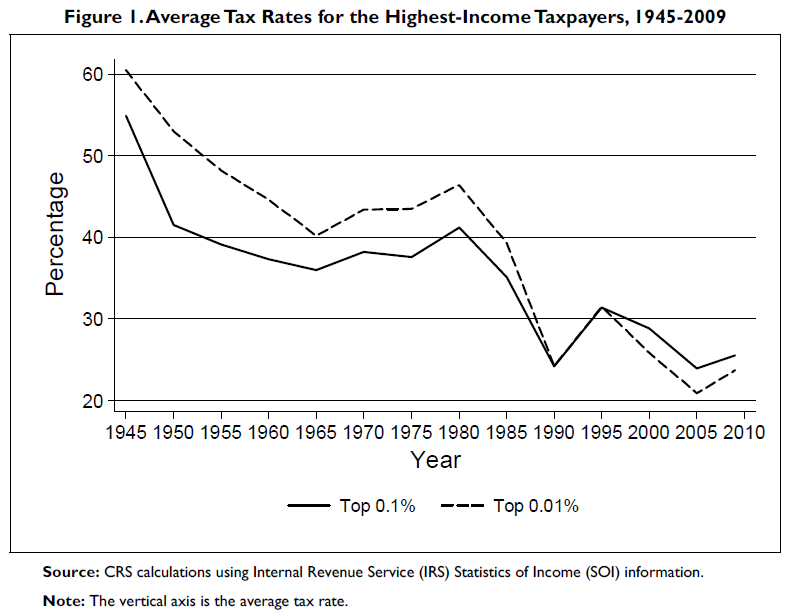 However, the top tax rate reductions appear to be associated with the increasing concentration of income at the top of the income distribution. The share of income accruing to the top 0.1% of U.S. families increased from 4.2% in 1945 to 12.3% by 2007 before falling to 9.2% due to the 2007-2009 recession. 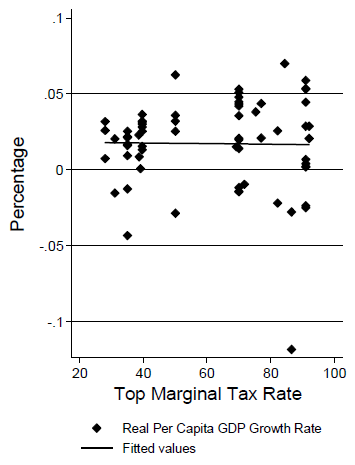 The evidence does not suggest necessarily a relationship between tax policy with regard to the top tax rates and the size of the economic pie, but there may be a relationship to how the economic pie is sliced.” In other words, the only definite outcome of decreasing taxes on the wealthy is to increase economic inequality, which has been shown to cause a host of societal problems. 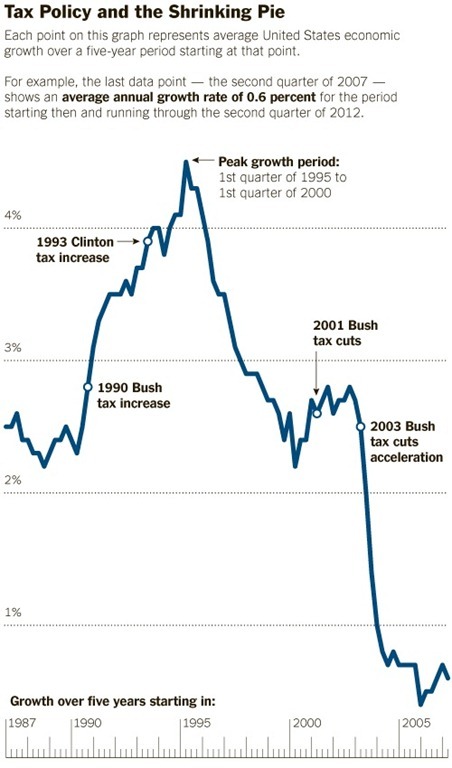 The chart clearly shows that the Bush tax cuts did not prevent the country from plunging into a deep recession. In fact there are many investments made by the federal government that are more effective than tax cuts at spurring economic growth, including funding of basic research, which leads to the development of new technologies for the market. For example, most of the technologies embedded in Apple’s popular IPhone originated in federally-funded research (see http://thebreakthrough.org/archive/american_innovation), as did the Google Search Engine, which was an outgrowth of a National Science Foundation grant to Stanford University. We conclude that there is no evidence that increasing taxes on the wealthy hurts the economy. Now let’s address the second, related question: does raising the highest marginal tax rate lead to higher rates of unemployment? To answer this question I made a plot with highest marginal tax rate on the x-axis (independent variable, data from http://www.taxpolicycenter.org/taxfacts/Content/PDF/toprate_historical.pdf ) and average annual unemployment rate on the y-axis (dependent variable, data from the U.S. Bureau of Labor Statistics, http://data.bls.gov/pdq/SurveyOutputServlet). The chart shows that increasing income taxes on the wealthy does not increase unemployment; if anything, the unemployment rate goes down when tax rates on the wealthiest increase. 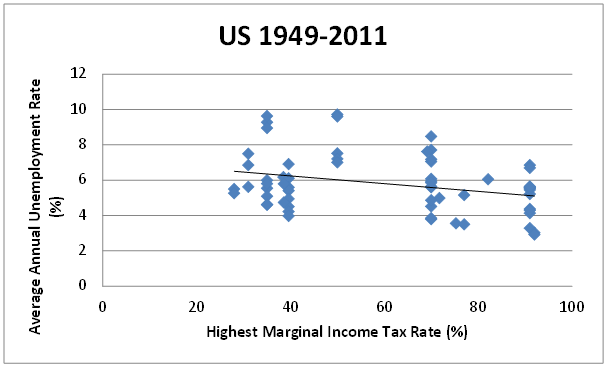 Many people don’t realize that tax rates on the wealthiest declined dramatically between 1945 and 1990, and declined further beginning in 1995 to the lowest levels on record in 2005 (see figure below). 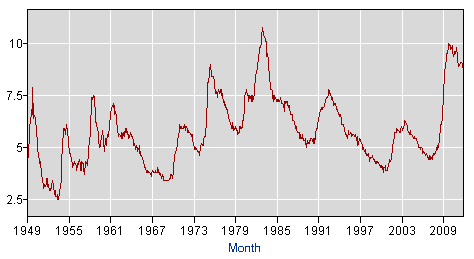 (from http://data.bls.gov/pdq/SurveyOutputServlet). The unemployment chart looks nothing like the previous chart of the highest marginal tax rate, indicating there is no correlation between the two. So why do Republican politicians keep claiming that lowering taxes on the wealthy will create jobs and grow the economy? I don’t have data to objectively answer that question. I can only speculate that their motivation is political rather than economic: they receive large campaign contributions from wealthy donors who, in return, expect enactment of favorable tax policies. This entry was posted in Economics, Politics and tagged Politics; Economics. Bookmark the permalink. 1 Response to Does increasing taxes on the wealthy hurt the economy and lead to higher unemployment?